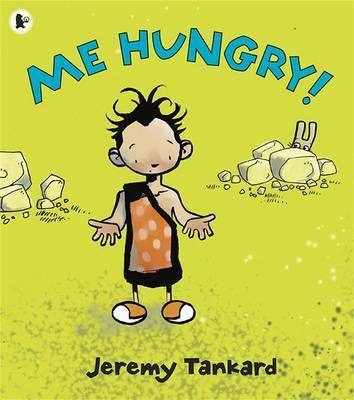 A hilarious prehistoric picture book about a brave young cave boy on a quest to find his own dinner!Edwin is hungry. Mum is busy. So the young cave boy decides to embark upon his first hunting trip, alone. But hunting isn't easy. The animals he encounters are determined not to be eaten: the rabbit hides; the porcupine is too spiky; the tiger too mean. But then Edwin bumps into a creature who is none of these things: an enormous, friendly mammoth, who is as hungry as Edwin! Together they can reach an apple from the top of the tree - and when Dad calls Edwin in for dinner, he's far too busy with his cave boy friend! Jeremy Tankard was born in Cape Town, South Africa, but he has also lived in the United States and Canada. Me Hungry! is his second book; he is also the author-illustrator of Grumpy Bird. About Me Hungry!, he says, "It's a true story. Honest!" Last time he checked, he wasn't a caveman, but it's possible that his ancestors were. When not making books, Jeremy Tankard likes to play music and spend time with his wife and daughter.